Laccaria laccata is a very common woodland fungus, and where you find one you are likely to find many more. Deceivers are mycorrhizal fungi. The cap colour changes quite significantly with age and depends also on the weather, and this characteristic is the origin of the common name..
Abundant in all kinds of woodland in Britain and Ireland, Laccaria laccata occurs also throughout mainland Europe and in North America. Austrian mycologist Giovanni Antonio Scopoli described this woodland mushroom in 1772, naming it Agaricus laccatus. (In the early days of fungal taxonomy most gilled mushrooms were placed in one gigantic Agaricus grouping, which has since been broken up into many other genera, leaving in the Agaricus genus a relatively small group of the 'true mushrooms', as they are sometimes called.) It was the British mycologist Mordecai Cubitt Cooke who moved this species into its present genus in 1884, at which time the specific epithet was changed to laccata. Laccaria laccata has a vast array of synonyms including Agaricus laccatus Scop., Agaricus incanus Bull., Agaricus farinaceus Huds., Agaricus rosellus Batsch, Clitocybe laccata (Scop.) P. 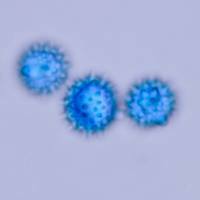 Kumm., Laccaria affinis (Singer) Bon, and Laccaria scotica (Singer) Contu. Laccaria laccata is the type species of the Laccaria genus. The generic name Laccaria translates to 'lacquer' (shiny paint), and the specific epithet laccata means varnished or coated with lacquer. That's what I call toadstool tautology, or to put it another way... on second thoughts perhaps not, as to do so would be tautologous! 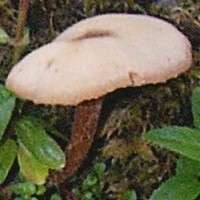 Commonly (and most aptly) known as Deceiver, this very variable mushroom is not always easy to identify with certainty. The broad gills and fibrous hollowing stems are helpful characteristics, but cap size, shape and colour are very little help because they come in so many varieties. 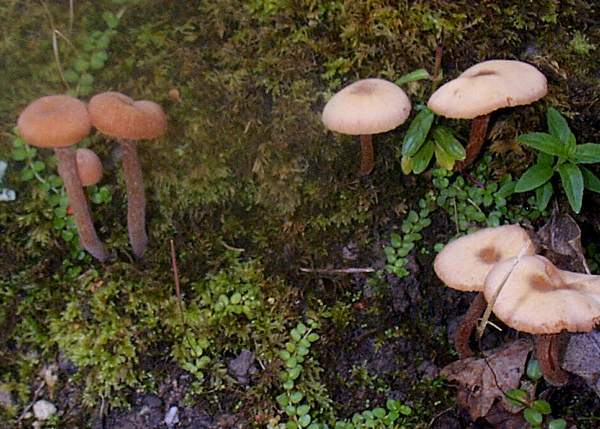 Often, however, you will find brown, tan and almost white caps together - as in the two groups illustrated here (darker caps in the distance). 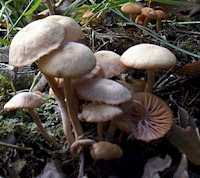 2 to 7cm in diameter, the caps of Laccaria laccata are initially convex and become almost flat-topped at maturity. 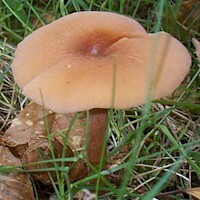 During wet weather young caps of a Deceiver are deep tan or reddish-brown (sometimes as the specimen seen here, but often much more orange). During dry spells the caps and stems become much paler buff and eventually almost white. Very old Deceivers sometimes become funnel-shaped and very distorted. The broad, deep gills of the Deceiver are widely spaced and interspersed with shorter gills. Long before the cap fades to buff, the tan gills begin losing their colour. This is because they get covered in spores and - perhaps surprisingly when you see how dark the young gills are - the spores of this mushroom are white. 6 to 10mm in diameter and 5 to 10cm tall, the tough, fibrous stems are increasingly more 'hairy' towards the base. 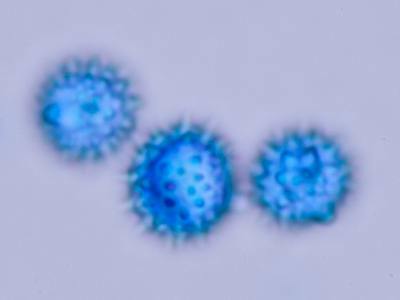 Globose, 7-10μm diameter, with spines up to 1.5μm tall. Among leaf litter in all kinds of mixed woodland and on heaths. Laccaria laccata is ectomycorrhizal with various broadleaf and coniferous trees including pines (family Pinaceae), beech and occasionally oaks (Fagaceae) and birches (Betulaceae). June to November in Britain and Ireland; later in the year in southern Europe. Laccaria amethystina is a violet coloured member of the same genus; once it has dried out it becomes pale buff and virtually indistinguishable from Laccaria laccata. 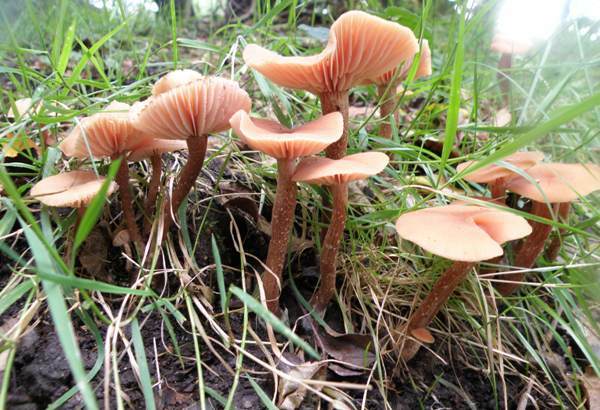 Laccaria bicolor is distinguished by its stem, which has a lilac base and a tawny upper section. 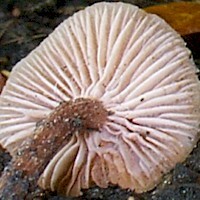 Laccaria proxima is similar but has a scurfy cap and ellipsoidal spores. 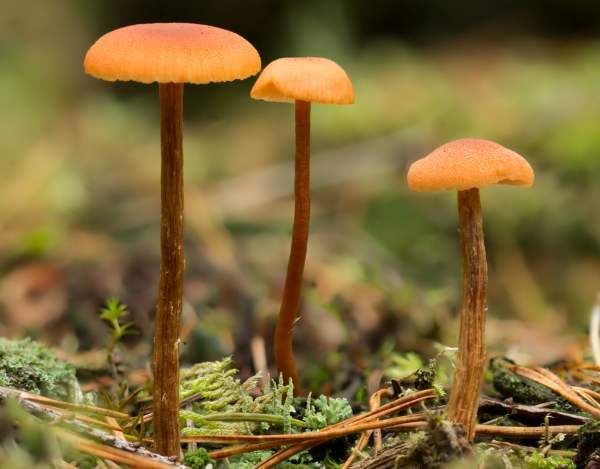 Laccaria tortilis is a tiny deceiver with a contorted cap. The Deceiver Laccaria laccata is an edible mushroom, and although perhaps not one of Mother Nature's finest offerings the caps are very good when fried, tasting rather like shop-bought button mushrooms (Agaricus bisporus). Deceivers are also fine when used to make mushroom soup. The tough fibrous stems are best discarded. Giovanni Antonio Scopoli (1772). Flora Carniolica (2nd ed.). p.444.